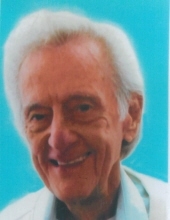 James "Jim" Edward Wilson, Jr. Celebrating the life of James "Jim" Edward Wilson, Jr.
Obituary for James "Jim" Edward Wilson, Jr.
James “Jim” Edward Wilson, Jr., 89, of Fayetteville passed away on Sunday, October 28, 2018. He was born in Atlanta, GA on August 3, 1929 to the late Irene and James Edward Wilson, Sr. He was retired from Dobbs House where he was a Manager. He was preceded in death by his parents and is survived by his daughters, Denise Johnson and Bonnie Kanofski; his son, Darrell Wilson; twelve grandchildren; twenty great-grandchildren; four brothers; and numerous nieces and nephews. The family lovingly requests contributions in Jim’s memory to the Lewy Body Dementia Association, https://www.lbda.org/. To send flowers or a remembrance gift to the family of James "Jim" Edward Wilson, Jr., please visit our Tribute Store. "Email Address" would like to share the life celebration of James "Jim" Edward Wilson, Jr.. Click on the "link" to go to share a favorite memory or leave a condolence message for the family.